A crowded double-decked tram leaving Eyre Square heading to Salthill. Note the double track lines to allow a second tram pass in the opposite direction. Salthill began to really liven up with the arrival of the Dublin to Galway train in 1851. Holidaymakers arrived at the resort in some style. Trains were met at the station by horse-drawn ‘cars’ or ‘buses’ which went out directly to the seaside. Salthill already had its traditional summer visitors. Farmers and their wives, often dressed in their best Sunday clothes, would come and gossip along the ‘Lazy Wall’, or ‘enjoy a mouthful of fresh air from the broad Atlantic’. If they were very brave they could endure a sea-bath, or a cold sea-shower (which consisted of nothing more than standing in a cubicle and having a bucket of water poured over their heads ). Men could hire swimming togs for the day, and take a dip. On one occasion those dreadful Queen’s College students took over a ‘car’, dragged it to a precipice along the route, and threatened to push it over. We can imagine the screams. A sense that Galway’s star was rising was reflected in a dramatic improvement in public transport. 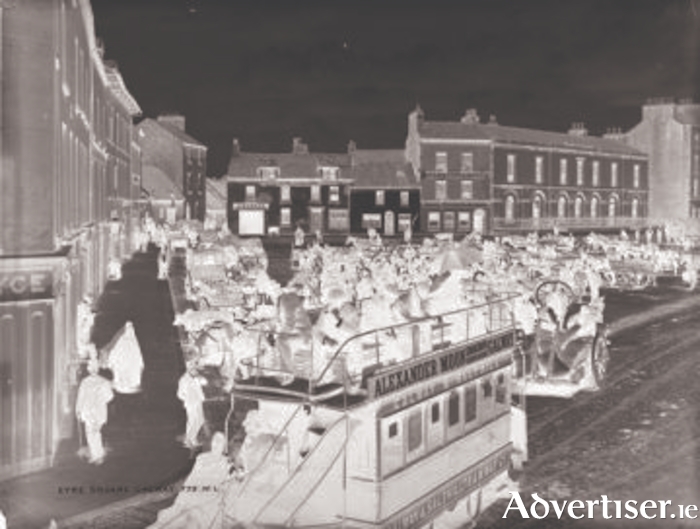 A horse drawn tram service was introduced from Forster Street to the Eglinton Hotel in Salthill. The single track line, which featured a three feet wide gauge, required passing points to accommodate two-way traffic. A much sought after open-top, double decked, tram, which was drawn by two horses, allowed passengers enhanced views as they moved smoothly along. Despite all this luxury, not everyone was happy. People complained that Sunday schedules did not always tally with Mass times at the Jesuit church. In 1911 a passenger wrote to a local paper: ‘On last Sunday morning, which was a wet one, the Tram Co. provided one car at half-past nine, and one at half-past 10 to carry upwards of two to three thousand people to Mass! Rows sometimes led to fisticuffs. A visiting apprentice from Dublin got into an argument over his fare. He became so incensed that he lashed out at the conductor. The apprentice, however, picked on the wrong man. The conductor responded by ‘knocking the young man off the car’ who then hit the wall running alongside the line at Nile Lodge. The apprentice sued the company for substantial damages. On Tuesday August 4 1914 Britain declared war on Germany, an announcement that cast a pall over Wednesday’s Plate day at Ballybrit. There was nothing like a full attendance. This situation continued for a number of years. An irregular transport service was provided by the original one-horse cars, but, despite the complaints, the people were used to a decent tram service, and the town lost some of its lure as a progressive and lively holiday centre. However, necessity was the mother of invention at that time. The Galway-Salthill route was taken over by a transport fleet that was no longer drawn by dependable dray horses, but propelled by modern motors. The new Galway General Omnibus Company followed the same Salthill route as its tram predecessor, only departing from Victoria Place and not Forster Street. The route is pretty much as it is today. In 1936 the Omnibus Company was taken over by the Great Southern Railways (GSR ). That takeover was blessed by a Government policy, which favoured public transport over private operators. Great Southern Railways became Córas Iompar Éireann, and that company became the familiar Bus Éireann. In recent years a new Government policy favoured competition between public and private operators. A local man, Dónal Joyce, won a licence to run a private bus service to Salthill. Mr Joyce’s first ‘City Direct’ bus ran in June 1999. NOTES: *Many of Somerville and Ross’s books are still in print. Notably Some Experiences of an Irish RM (1899 ), and the Real Charlotte (1894 ). Their condescending but amusing Through Connemara in a Governess Cart (1893 ) is worth buying if you can find it. **Horses were considered essential on and off the battlefield during World War I. The British army purchased more than 460,000 horses and mules from across Britain and Ireland during the conflict. In the last few weeks I have been leaning heavily on Paul McGinley’s entertaining and informative Salthill - A History, now on sale.